'""re chain» may be mounted only on the rear wheels. ateerarice for tire chains only with 205/55 Rl6TorHM + S tires. ■ ~ ^irn thick spacers for a wider rear track are omitted in 1990 models. 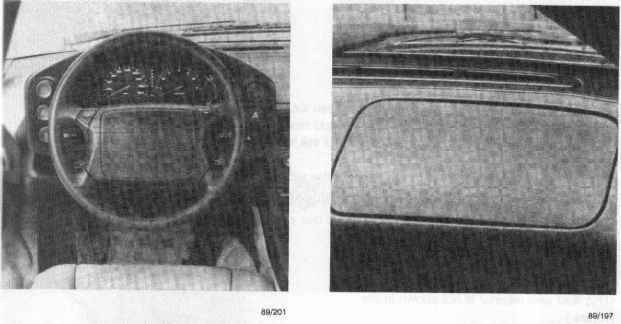 ^.r s distributed to the windshield through a ingle-piece defroster mask, which is inserted r she dashboard. :.='5 are standard with 3-point automatic reel sea£ belts for the rear seats. 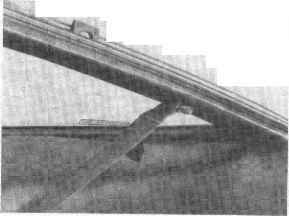 The rear anchorage point is located on the rear lid frame sOov<e the rear side window. Al oars for the USA and Canada are standard with an airbag system (SRS) for the driver and front seat passenger beginning with 1990 models. 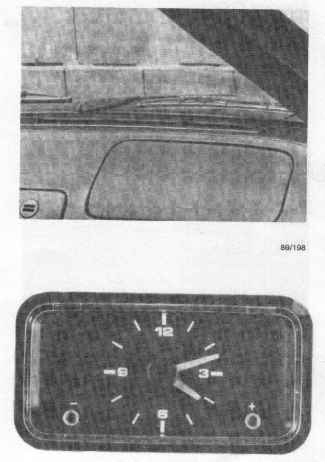 -■unction of the airbag system is described in the Airbag Brochure, WKD 493 6xx (1987), for the 944 -odel series. 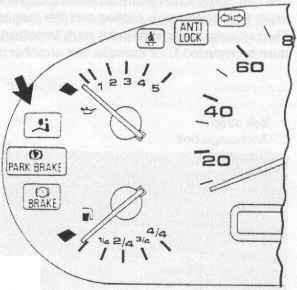 This description of function is comprehensively applicable to the airbag system introduced for 1990 model 928 S4 / 928 GT cars. 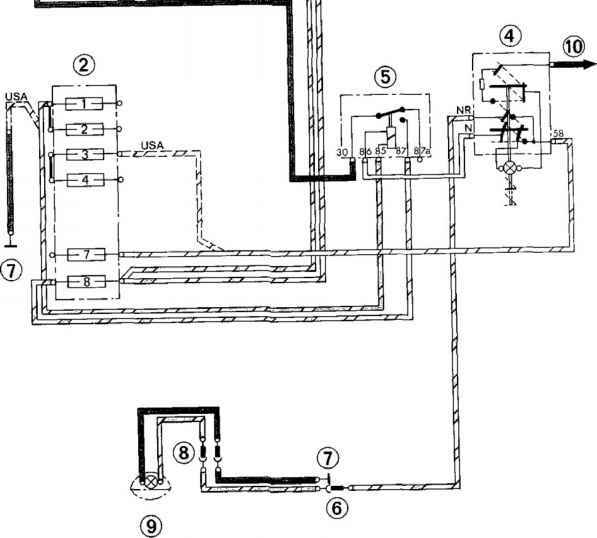 deviating modifications specific for these models are described in this model information brochure. "he Supplementary Restraint System (SRS) consists of an airbag control unit, two crash sensors, an airbag unit in the steering wheel, contact unit and front passenger's airbag unit. The airbag control unit is mounted with shear-off nuts on the front center tunnel section below the center console. Special Tool 9259 is required to unscrew the shear-off nuts. Note: Never make ground connections lor other additional electric equipment on the airbag control unit. BLACK - For cars without airbag system (Rest of World). Holding only for the car end of the plug. An adapter plug is connected on the car end of the plug. The control unit for cruise control, which had been located here, is now mounted behind the left driver's footrest in all cars (including Rest of World models). Airbag system is diagnosable. Fault memory of the airbag control unit can be read via the 19 pin diagnosis plug of the car with help of a 9268 Flashing Code Tester or Porsche 9288 System Tester. Disconnection of the 6-pin plug is possible only after destruction of the lead seal retainer. 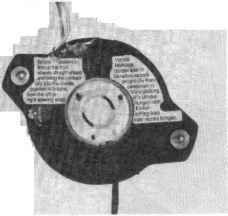 Different colored lead seal retainers are used to recognize whether a plug had been disconnected. "-Te airbag warning lamp in the instrument duster must light up for about 5 seconds after rjrrang on the ignition and go out afterwards. Afth a fault in the airbag system this warning amp will not go out or lights up while driving ihe car. 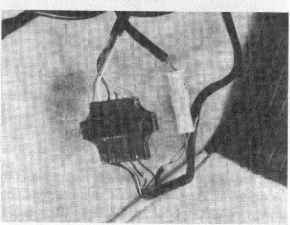 3-oth airbag crash sensors are identical with the crash sensors used in 944 model series cars. Crash sensors are located in the driver and front passenger footwells at the top on the left and right wheel house walls and mounted with two shear-off nuts and two normal nuts. Special Tool 9259 has to be applied to unscrew the shear-off nuts. The seat belt is sewn (tear seam) into a loop in the area of the bottom belt anchorage point. A plastic cover (belt protector) is pushed over this loop and sewn additionally. The belt strap has a white color mark (crossbar) which is hidden by the belt protector. The seat belt must be replaced if, for example, this crossbar mark is visible after an accident. The airbag unit is held in the steering wheel by self-locking screws, which must always be replaced after removal and installation of the airbag unit. Tightening torque = 9.7 Nm. 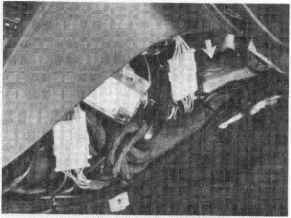 Electric connections for the driver's airbag unit are made via a contact unit between the steering wheel and steering column switch, or steering column, as in 944 cars. Lead seal (1) of the contact unit must be removed only after installation of the steering column switch on the steering column. Conform with information on the labels when installing the contact unit.